We'd like to announce Volume 3 of our very well received series 'Bicentennial Superstar', a brandnew TNT Records' CD release. It is going to be presented in our usual high quality standard. Out in just 10 days from now it will be a 2 CD set containing two complete shows taken from soundboard recordings. Once more we were able to use the technical power of our friends at 'Audionics' – most likely THE premium and still active label when it comes to rare recordings in best possible sound. A 16-page booklet containing all the information you need to know regarding the concerts is also included. This time we paired two rare shows from early June and early September of 1976, both recorded from the soundboard. When Elvis was on Tour in El Paso, Texas on June 2nd he delivered what the fans expected. The show clearly had its moments of excellence and critics were nice enough to call it a typical 'Elvis spectacular'. 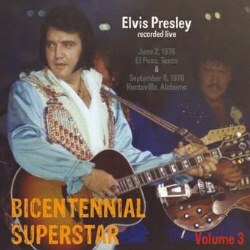 A few months later Elvis played Huntsville, Alabama on September 6. The tour didn't start very successful but Elvis was able to get in better shape and around September 4 he delivered mostly decent shows until the end of that tour. Sit back and enjoy experiencing Elvis in the Summer of 76 doing some great renditions of his Concert standards of the time like 'Hurt', 'You Gave Me A Mountain', 'Help Me' and 'America The Beautiful'!